You’ve probably noticed how quiet my blog has been lately–even quieter than usual. That’s because I participated in NaNoWriMo this year. 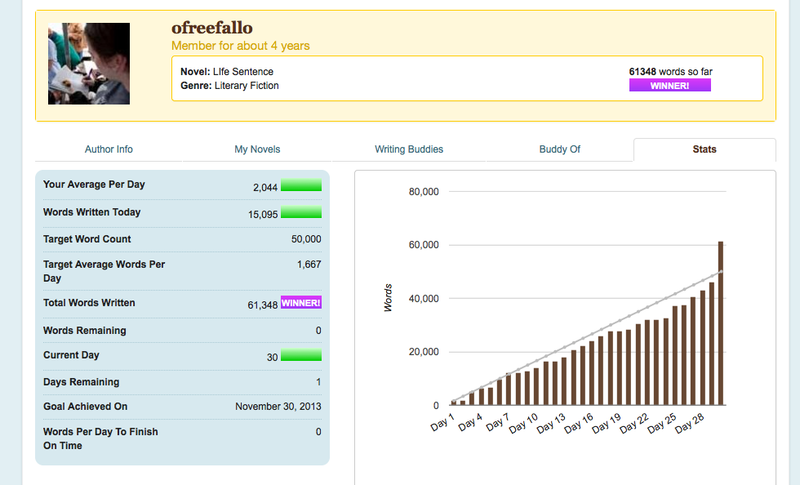 In the month of November, I wrote more than 50,000 words of a novel. First of all, let me say: WOOOOOO! I’M A WINNER! I’M AWESOME! I set out to write a what seemed like an impossible number of words last month–not to mention maintaining a full-time job, buying a new car, keeping my house clean and in good repair, celebrating my 28th birthday, and doing all of my homework for grad school on time. I can barely believe nothing major fell apart! Going through this process has definitely helped me with my “madman” stage. For me, the hardest part is getting started–ignoring my inner editor/critic and just getting something up on the screen or down on the page. Then, later, the editor/critic may be unleashed to slash and restructure gleefully. But editor/critic has nothing to work with without the madman. So NaNo was valuable in helping me pour out words without thought to the consequence. Want to change your main character’s name midway through? Do it! Don’t even worry about searching the 20,000 words you’ve already written to fix it. (You might end up changing it again later, anyway). Want to add a new subplot to your secondary character? Why not! Just leave a note to yourself to work in the details leading up to this plot, and keep on writing. Above all, keep writing. I’ve heard from some people that they can’t imagine writing a novel non-chronologically. That is, they have to write the story exactly in the order they think it will be read. That doesn’t work for me at all. I jump around like crazy, keeping an Excel sheet to track where I am with each story thread. In a short amount of time, where the focus is to pump out as many words as possible, I found it most helpful simply to write what was on my mind. If I tried to force it, I might risk wasting valuable writing time. (Also, I find that my best work happens when things are flowing–when nothing feels forced.) If I was thinking about the final scene, I wrote that. I’d jump from the end to the beginning to the middle. Sure, things will change in the final version, where it won’t make sense that my main character is talking to a friend in the end with whom she’d had an irreparable fight in the middle. But these are all things to smooth out in revisions. My point here is that everyone works differently. Just as every story is different depending on who is telling it, so too is the writing process unique to the writer. Basically, as long as you write, you’re doing it right! But what was that nasty word I said? “Revisions”? What distinguishes newbs from pros is simple: perspective. Once you reach the end, the most important part is sitting back and saying to yourself, “Well, that was a nice start.” Unless you are some kind of creative genius, in which case I doubt you read my blog, your NaNo project is not yet ready for prime-time. Don’t hit “send” on all those queries to agents just yet. Revise, revise. Let it sit, let it simmer, and revise again. However, much of this draft will be chopped up, salvaged, polished, or tossed during revisions. This is very much a rough draft. I see many weaknesses in the manuscript already (and I haven’t even started re-reading it yet!). And there are other parts that aren’t necessarily weak, but they aren’t wonderful yet. I’m extremely pleased that I was able to reach the word count that I did. NaNo really helped me set goals and meet them, and I owe that in large part to everyone who encouraged me this month–both fellow novelists and non-writers. But that’s all NaNo was–a word-count goal. It doesn’t mean I have a novel on my hands yet. All I have are seeds that I planted that are beginning to shoot up tender leaves. I have to water and fertilize the plants, shield them from the elements, make sure they grow strong and true before I can really say I have a garden. This is the time where I will go through each paragraph, each sentence, with a fine-tooth comb. Now that I’m used to switching metaphors midstream (shhh, editor/critic! ): I want my baby to be as perfect as possible when the time finally comes to look for an agent. She’s gonna have her hair brushed, her finest dress free of stains and wrinkles, and all that apple sauce wiped off her face when it’s time to shine the spotlight on her. *Except, perhaps, people with young children, who stared at me in horror at the idea of writing anything in one month. Yay you! Congratulations, awesome accomplishment. Oh wow! Congratulations, lady! This is awesome news!